The Etsy shop has been updated with two of my most popular (and previously unreleased!) Croshame pieces. Krampus Time is Here Again! Available HERE. 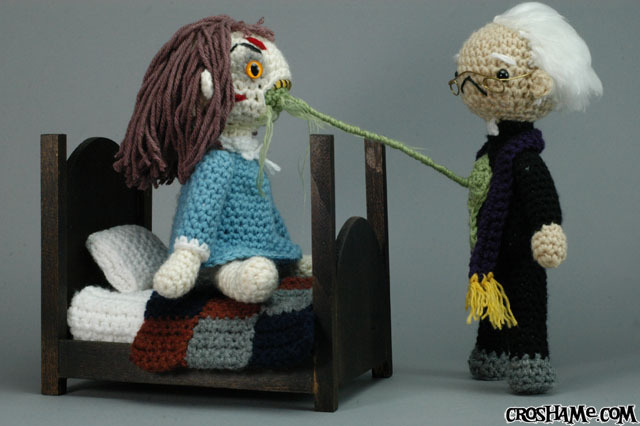 And the Exorcist Playset! Available HERE. This entry was posted on January 7, 2012 by croshame. It was filed under Antigurumi, Croshame, Etsy Store . Have you ever written up this pattern? If you have is there a link to it. My cousin in Tx is really interested in it and she has had a rough year (divorce) and if it is within my budget, I would be interested in making one for her. She really loved this. Thank you. Nope, sorry… I only sell the finished product, not the pattern.